(CNN) -- Venezuelan President Nicolas Maduro is unapologetic about his government's response to opposition protesters during weeks of unrest in the South American country. 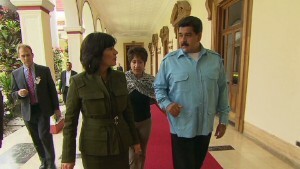 Think about what the U.S. government would do if a political group laid out a road map for overthrowing President Barack Obama, Maduro said Thursday in an exclusive interview with CNN's Christiane Amanpour. "What would happen in the United States if a group said they were going to start something in the United States so that President Obama leaves, resigns, to change the constitutional government of the United States?" 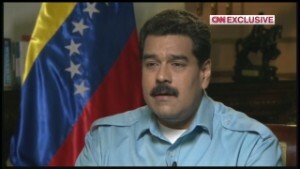 Maduro said, according to a CNN translation of his remarks. "Surely, the state would react, would use all the force that the law gives it to re-establish order and to put those who are against the Constitution where they belong." Maduro said that a minority group among the opposition is responsible for a "violent plan." That group, he said, has put the opposition in a "dire situation." The Venezuelan President spoke with Amanpour in an exclusive interview a day after the one-year anniversary of the death of his predecessor, President Hugo Chavez. The interview aired Friday on CNN. Weeks of anti-government protests have rattled Venezuela and drawn sharp responses from Maduro, who has called for peace while describing those opposing him as fascists and extremists. Demonstrators say they have taken to the streets to protest shortages of goods, high inflation and high crime. It's the biggest threat Maduro has faced since his election last year. One opposition leader who encouraged protests, Leopoldo Lopez, is behind bars, facing charges of arson and conspiracy. "He created a road map to topple the legitimate government," Maduro said. "So now he's in jail and he has to go through justice." Maduro said he supported Venezuelans' right to protest conditions in the country, which he said were not as bad as was being portrayed. For example, he said, unemployment has dropped from 25% to less than 10% over the past decade and extreme poverty has fallen from about 35% during the 1990s to 6% today. He made no apologies for continuing work on the goals spearheaded during the reign of his predecessor and lifted from the playbook that guided his mentor, former Cuban President Fidel Castro -- health care and education to all and the eradication of extreme poverty. Protesters have accused Maduro's government of violence that has claimed some 20 lives during the protests. Government officials have blamed Lopez and other opposition leaders for fueling the violence and not doing enough to stop it. 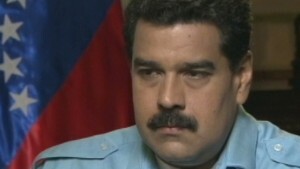 Maduro said the unrest had not kept him awake at night. "I sleep like a child," he said. "Luckily, I have peace of mind, total peace of mind, and I have it because I know I've been loyal and I'm filling the legacy of this marvelous giant figure who is President Chavez, and it gives me peace of mind, and I do things with honesty to favor my people." Maduro said Venezuela has fine relations with the people of the United States. He cited trade union workers, artists, intellectuals and members of social movements as examples. But he acknowledged that relations between Washington and Caracas have been rocky. "There is sufficient evidence of U.S. agencies, of how you have conspired to put an end to this revolution, to destroy President Chavez," he said. Last month, Maduro expelled three U.S. diplomats form Venezuela, accusing them of conspiring against his government. In response, the United States last week expelled three Venezuelan diplomats. But Maduro held out hope for warmer relations. "We want to have a new type of relation, based on respect, equality among states and the recognition of what we are today," he said. He said he was confident that his recent appointment of Maximilian Arvelaez as his new ambassador to Washington, a position that's been vacant since 2008, would result in progress. "I'm certain that he will be very helpful to establish new levels of relations," he said. Washington has appeared far less enthusiastic about closer ties with Venezuela. A State Department spokeswoman said last month that the United States wants to develop "a more constructive relationship with Venezuela," but noted that wouldn't be easy. "We've said many months ago that could include an exchange of ambassadors," the spokeswoman, Jen Psaki, told reporters. "But Venezuela also needs to show seriousness for us to be able to move forward. And recent actions, including expelling three of our diplomats, continue to make that difficult." That tense relationship could change, Maduro said. Asked what his message was for the United States, the Venezuelan President didn't hesitate. "My message is respect, dialogue, overcoming the visions that they have about Venezuela. Precisely, I made a decision to designate a new ambassador for the United States," Maduro said. "Don't go into a dead end in relation to Venezuela and Latin America. Our message to everyone in power in the United States is respect Venezuela, respect Latin America, and let's establish new levels of relations." CNN's Luis Arce contributed to this report. It's been a month since violent clashes in Venezuela began -- yet the conflict continues to rage. Venezuela's President severed diplomatic relations with Panama Wednesday, accusing the Central American nation of being a "lackey" for the United States. There's an attempted coup in progress in Venezuela, orchestrated and directed by elites in the United States, believes Maduro. Can the socialist government live? Student protesters pack the streets. Violence surges. Tear gas billows. Will Nicolas Maduro's rule be able to survive this crisis? At first CNN was ordered to leave the country -- now Venezuela's president says CNN can stay. When Leopoldo Lopez turned himself in to authorities, he did it on his terms -- and not before delivering a passionate message to his supporters. Here's a Q and A to bring you up to speed with what's going on. Who is opposition leader Lopez? Who is the Harvard-educated politician leads the Venezuelan opposition? CNN's Rafael Romo reports. David Frum: The question is being asked: Is Chavismo finally cracking in Venezuela? Opposition protesters in Venezuela are flocking to the courthouse where Leopoldo Lopez is expected to appear. Sen. John McCain reacts to the arrest of Venezuelan opposition leader Leopoldo Lopez, saying Venezuelans are fed up with socialism. Demonstrators pack public squares. Flames shoot into the air. Tear gas sends crowds scrambling. Bodies are carried from the streets.